Ah, spring is finally upon us, the season of renewed energy with a sparkle in the air. Just like the flowers and birds, it’s a season where K-Pop thrives. From ballads to party anthems to mellow love songs, spring is a busy time for the music industry. Talking about mellow love songs, Bolbbalgan4 are the reigning queens of quirky, sweet songs. Returning after a full year with Youth Diary: 1 Flower Energy, BOL4 are here to usher in the spring with a skip in their step. It's no secret that Ahn Jiyoung and Woo Jiyoon have become the sweethearts of the Korean public, speaking to the youth through their frank, honest lyrics. With their unapologetically vulnerable lyrics wrapped in sweet and addictive melodies, it’s not hard to see why they dominate charts with every one of their releases. “Bom” is a track that is very distinctively Bolbbalgan4 and perfect for the spring. The lyrics sing of the pure request of a girl who wants the guy she likes to reciprocate her feelings of wanting to spend all their time together. Composed by Ahn Jiyoung herself, the gentle acoustic guitar and relaxed groove of the track have a smooth flow that’s easy on the ears and effortlessly captures the spirit of spring. The simple lyrics, delivered in Jiyoung’s characteristic genuine, soft voice, make the listener feel like they’re listening to a snippet of someone’s personal diary. 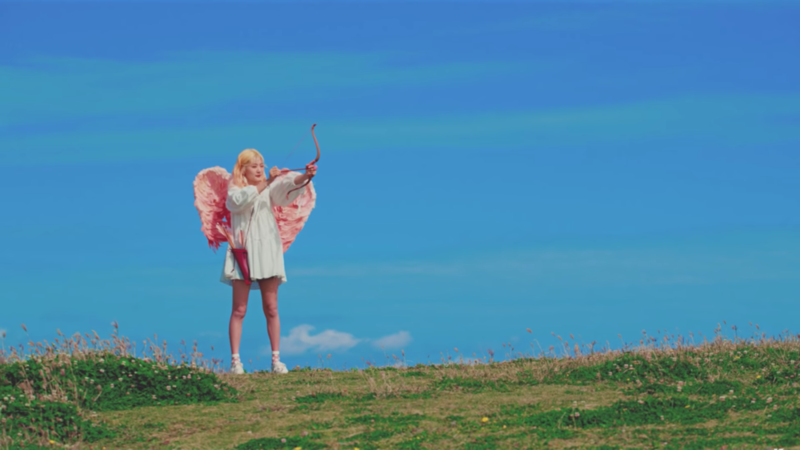 The music video has Jiyoung playing the role of Cupid, using her arrows to get her crush to spend time with her and make him see he likes her too. The track ends with a short instrumental delivered by Jiyoon on the acoustic guitar. “Stars Over Me” is an upbeat, bubbly track that sings of going stargazing with a lover. Unlike “Bom,” this song has a bit more of a kick to it that comes from both the bright instrumental and the unique delivery of the lyrics. The combination of English and Korean in the track’s lyrics, despite being an artistic touch the duo has used before, makes the song more dynamic and addictive. The music video sees Jiyoon and Jiyoung enjoying themselves in different places, taking more of a friendship route on the song as opposed to romantic. Emoticons and lyrics appear on screen making for quite a visually pleasing video. “Picnic”, a track composed by Woo Jiyoon, is a light, breezy track that sings of wanting to go for a picnic with a loved one. The conversational tone of the track gives it a very personal touch. The track “Seattle Alone” has to be my absolute favorite off the album. While very in line with Bolbbalgan4’s music, it has a completely new, offbeat vibe about it. With a stripped down, melancholic melody line, the track reminisces about memories shared between lovers in Seattle. “Mermaid” is a sorrowful song that sings of the moments in a relationship before a break up. The instrumental slowly builds from a somber piano to a grand instrumental that allows the song to hit the emotions harder. While this comeback did feel quite safe, it’s a genre in which Bolbbalgan4 performs well and this album only helped in cementing that further. A smooth listen from start to finish, the album touches on a range of emotions, delivered through their honest lyrics and Jiyoung’s ability to pack emotion into her singing.